I have been reading about Christo, and my favorite book is by Burt Chernow, entitled “Christo and Jeanne Claude”. A wonderful, thought provoking book! Note to self: I have to buy my own copy as the copy I have from the library is overdue…. His collaboration with his wife, Jeanne Claude, is a partnership and a true marriage, a dual force of collaboration. Sharing the same birthday, their vision and heart is unparalleled. They work side by side as if one person. His earliest works feature wrappings. He has wrapped barrels, cars, women(!?! ), buildings, magazines, pictures &bicycles. More recent works exhibit fabric draping; The Gates project of Central Park, NY, featured saffron fabric panels…and 46 miles of hems! Fountains, farmland, bridges, buildings, statues, coastlines, and entire islands have been transformed by Christo. 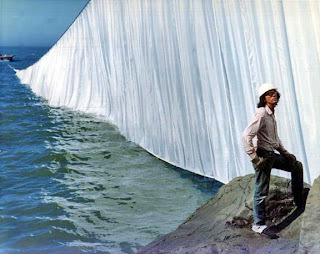 Christo currently has a project in the works; “Over the River”, slated for instillation in 2013. The Exhibit will last for 14 days, yet will have taken 21 years to plan… With the extreme effort and tedious planning comes the ironic knowing that it is all temporary. With many years and dollars invested, the art is often gone in a matter of days, sometimes hours. As professional floral designers, we hold the same ideals in tension….audacity, adventure, generous intentions, irony, tenacious perseverance. It is a wonderfully absurd concept: All the planning and designing for a wedding, event, or even a party is for just a few hours. The beauty isn’t that is lasts forever, but that we caused it to exist in one spectacular moment.